Nothing says 'Happy Labor Day' more than September call-ups, especially for the Chicago Cubs. With a 4.5 game lead over the Milwaukee Brewers, the Cubs have a little bit of breathing room as the last month of the baseball season gets under way, which should allow manager Lou Piniella to rest a few players down the stretch. Here are some players I think the Cubs should bring to the big club, in an attempt to give Piniella some help (like he'd listen to a student-blogger, anyway). Micah Hoffpauir, first baseman/left fielder. 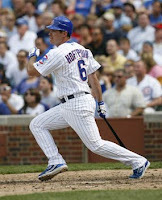 Hoffpauir is a younger, cheaper version of Daryle Ward, so I expect to see the young lefty slugger join the team. He hit 25 homers and drove in 100 runs while posting a 1.145 OPS at Triple-A Iowa and could give Derrek Lee a rest and give the Cubs a valuable lefty bat off the bench. It would be wise for the Cubs to carry three catchers down the stretch to give Geovany Soto and Henry Blanco some off time. His offensive numbers aren't terrible (.275 batting average 17 HR 64 RBI) and I'm sure the boys who play backstop could use some time to rest. Hart has tons of potential, but unlike 2007, he was unable to hit his stride with the big club. Hart could be a valuable pitcher down the stretch, whether it be as a long reliever or as a spot starter. Especially if this Zambrano stuff keeps up. Torres is the kind of player the Cubs need to bring up based on one thing: speed. Torres swiped 27 bags and posted a .388 OBP thanks to 53 walks in Iowa. That ranked second on the team. He's the late-inning pinch runner the Cubs could utilize without worrying about running out of catchers. The Cubs are so solid up the middle with DeRosa, Theriot, Cedeno and Fontenot, I doubt they'll bring up anybody at that position. But if they do, it will likely be Scales, who notched a .914 OPS as a second sacker with 94 runs to lead the Iowa Cubs. Numbers wise, Torres and Scales (30 and 31 years old, respectively) are basically 4-A players that are as likely to make an impact as you or me, but you never know with some of these players. You never know when there's an Orlando Merced or Tony Womack out there, waiting to contribute. I'm pretty sure Lou has made up his mind and those players are already on their way to Wrigley Field as we speak or could be in town already. Other players that just missed the cut: Michael Wuertz, Angel Guzman, Felix Pie, Jose Ascanio, Josh Kroeger. Coming later this month (God willing) a blog on how to put together a playoff roster.